The Custos of the Franciscan Custody of the Holy Land, Fr Pierbattista Pizzabella o.f.m. made his Canonical Visit to Rhodes, arriving on 7th March 2012. We were delighted to meet him once more. 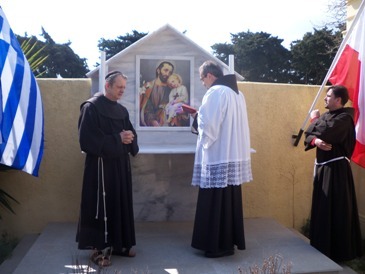 He inspected all the Franciscan properties and visited the Catholic Cemetery where he blessed the new altar to St Joseph which was built with the help of funds gifted from Poland. The Father Custos was delighted with the input of our cemetery volunteers who have worked so hard to make it into a beautiful and peaceful place of repose for our departed brothers and sisters. It is a great pleasure to the Custos that the lay people of our parish are so closely involved at all levels and give so generously of their time and talents.